Find Better Ideas, Faster ® with a custom promotional stunt trend report, our PRO Dashboard and 80+ categories of premium trend reports. 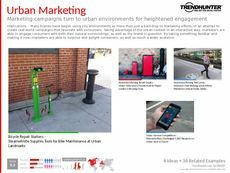 The Promotional Stunt Trend Report offers an informative look into the best examples of the interactive marketing based on promotional stunts. We examine multiple campaigns that managed to capture audience attention and became successfully widespread amongst consumers. We also outline the different aspects of a successful promotional stunt that can be undertaken, to get the perceived reaction you seek. Our findings are ideal for marketing executives, advertising professionals and anyone else seeking to generate positive feedback and word-of-mouth marketing. Learn how to adopt a promotional stunt campaign that successful displays social media savviness and a clear brand message through this report. Trend Hunter's Promotional Student Trend Report is designed to help foster creativity, thanks to an expertly curated collection of crowdsourced research on effective promotional stunts.